- Amanes, a lament from the Smyrneika tradition in free meter and the hijaz mode. 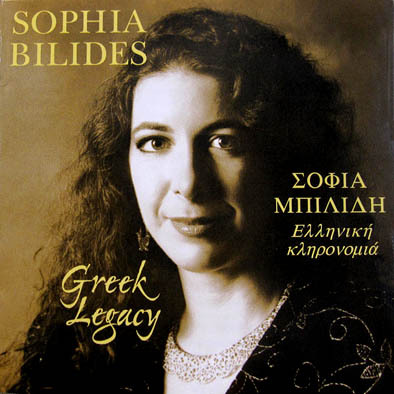 Sophia Bilides has been called the foremost practitioner of Smyrneika, a cabaret tradition sung by Asia Minor Greek refugees in the 1930s-40s. A second-generation Greek-Italian American, Sophia was raised in New Haven, Connecticut, where the refugees of the village of Permata had resettled, including her grandparents. She grew up absorbing the songs of their generation, heard at weddings, dances, church events, and family gatherings. Despite many other musical influences vying for her attention, Sophia was drawn to the hearfelt and highly ornamented singing style of her Greek Asia Minor roots. With many of the elders gone by the early 1980s, source material came primarily from her mentor, the Dino Pappas, collector early Greek recordings. She also collected songs from community members willing to sing into her tape recorder. Smyrneika songs arose out an urban population where the music of Greeks, Turks, Jews, and Armenians influenced each other in the early decades of the 20th century. This vibrant cultural scene was shattered when conflicts led to the 1922 Asia Minor Catastrophe. The destruction of the port city of Smyrna (Izrir) led to the expulsion of two million Greeks from their homeland. Fortunately, highly skilled refugee musicians managed to keep alive their urban musical traditions by bringing their cosmopolitan talents to the Greek mainland and to America. Smyrneika requires a combination of superb vocal skills and a flair for entertaining, both of which Sophia Bilides has. She accompanies herself on santouri (Greek hammered dulcimer) and zilia (finger cymbals. The song lyrics center around the universal topics of nostalgia for the lost homeland, endurance, love, and the celebration of life. Sophia"s goal of sharing Smyrneika with as wide an audience as possible is reflected in her performance venues;, for example, the Richmond Folk Festival, the American Folk Festival, Lincoln Center for the Performing Arts, the Lowell Hellenic Culture Society Concert Series, The Astoria Ethnic Music Festival, and the Maliotis Greek Cultural Center"s Asia Minor Commemoration. Bilides was named a Traditional Arts Finalist in the MCC Artist Fellowships in 2006, 2008, and 2010.